It’s a loose connection, I know but I’ve been really loving three in particular black eyeliner pens recently so what better day to blog about them than Black Friday! 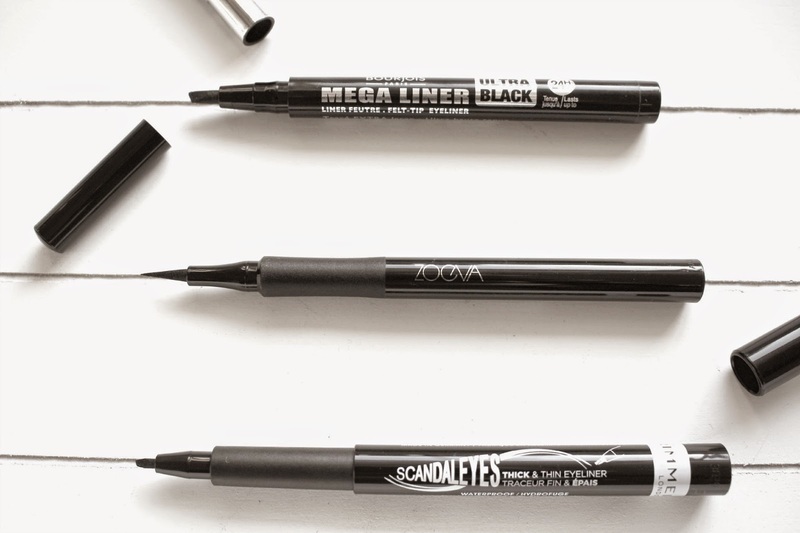 Each of these lovely liners is a star in it’s own right; there’s the calligraphy style Mega Liner from Bourjois, the super skinny pen from Zoeva, and then Rimmel’s Scandaleyes which is the best of both. The only negative I have is that the packaging doesn’t blow me away with Bourjois’ Mega Liner – it’s the only one out of the three to n to have a cushiony area by the nib, but that doesn’t bother me at all when I’m applying. It’s a weighty pen which makes it feel great quality and the pen itself is like a calligraphy pen which means you can create a variety of looks. You can flip it on its side for a thick line, or use the thinner side for a precise finish. The slanted edge is perfect for creating a sharp flick, and of all my liners, the lasting power on this pen is definitely one of the best! £7.49 from Boots here. Zoeva’s Cat Eye Pen is the skinniest pen I own – which I love for when a dramatic look can be muted down with a super skinny line. It’s ultra thin nib means you can get close to the lash line, but the formula won’t run into the waterline. I love it for daytime looks where you can add emphasis to the lash line but even sometimes get away with looking like you don’t have liner on. You can buy it from the Zoeva Website or BeautyBay. Finally Rimmel Scandaleyes. The nib on this pen again is ideal for either thick or thin liner application, and the cushioned pad by the nib makes it super easy to apply. This liner is just £5.49 from Boots so I always have one in my handbag for top-ups if I ever need one! My only negative about this liner however is that the nib feels quite hard, it isn’t as easy to apply as the other two liners! Have you tried any of these liners?